Pancakes and prayers — have we reached a point where even those two can’t get along? Frankly, yes. So praise the Lord and pass the syrup, the International House of Pancakes and International House of Prayer are fixing to throw down. IHOP (pancake), based in Glendale, Calif., has sued IHOP (prayer), based in Kansas City, for trademark dilution and infringement. The lawsuit, filed last week in U.S. District Court in Los Angeles, essentially said there was room for only one IHOP and that would be the restaurant chain that has been using the initials since 1973. The religious group drawing thousands from around the world to south Kansas City to prepare for “end times” was started just 10 years ago. Other than an acronym, the two have nearly zilch in common. The IHOP (prayer) on Red Bridge Road operates 24/7/365, sending a never-ending digital signal of prayers to Jerusalem, where it streams live on God TV for broadcast all over the world. 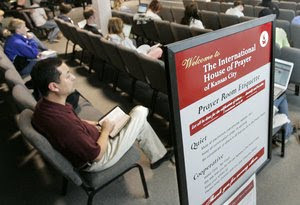 The lawsuit further accuses the church mission of adopting the name International House of Prayer knowing it would be abbreviated IHOP — the intent being to misappropriate fame and notoriety of the food chain. On Tuesday, IHOP (pancake) spokesman Patrick Lenow said the suit was filed only after the church mission refused repeated requests to stop using the trademark. “We are compelled to protect the 350 small-business owners who own IHOP franchises and the IHOP good name that’s been around for 52 years,” Lenow said. Thus the question, why sue now? The church mission started calling itself IHOP a decade ago. “They’ve expanded — and now some of the branches are serving food,” Lenow said. Among the seven defendants, four are in California where the suit was filed, including the Pasadena International House of Prayer. Although the suit also seeks attorney fees and costs of litigation, it does not ask for monetary damages. Calls to IHOP (prayer) chief operating officer Mark Schumacher were not returned. Gary Cooper, a former Houston attorney who until recently served as the mission’s chief financial officer, said the lawsuit lacked legal basis. “I don’t think it will go anywhere,” Cooper, who serves on an IHOP board, said Tuesday by telephone from Oklahoma. But Gary Hecker, a well-known intellectual rights attorney in Los Angeles and founder of the Hecker Law Group, said the court would probably side with the restaurant chain. “Because of that extremely famous name, IHOP may well have the right to protect itself even well outside the scope of selling pancakes,” Hecker said Tuesday. One defense might be that the two sides are so different that no confusion could exist. IHOP (prayer) was started by a man named Mike Bickle, who by his own admission grew up in a Waldo bar and claims to have traveled to heaven twice. The ministry is now planning to build a $150 million world headquarters — including IHOP University and a 5,000-seat conference center — along U.S. 71 in Grandview. Again, IHOP (pancakes) got there first. One of the restaurants is across the highway.